Yay for you Carol! Such a funny page and I love your caption. Your photo and kitty is hilarious. Then I must be a cat, as I certainly understand the importance of a good nap. That's how my Leo sleeps. On his back with his paw over his eyes. He says, "see that chair, it's mine, that recliner is mine also, and the bed is mine too. But I'll let you borrow them once in a while for a nap". 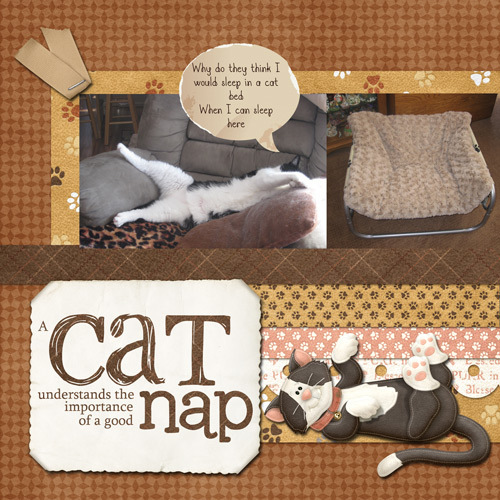 This is such a cute page and I love the paper strips that you used and the cute little kitty.